Photos: be sure that you have a clear photo of your pet in case you need it for a flyer. Photo should show any distinctive markings and the pet's outline. Microchips: Be sure you have your pet microchipped and registered with current information. The chip, unfortunately, cannot be used to track your pet as the technology RFID (like supermarket scanners). If your pet is microchipped but you have forgotten the number, a vet can scan the chip and give you the number. Then you can call the microchip company and pay to update the info. We sell low cost microchips and many animal control facilities do as well (they may or may not come registered; ours are registered but if you get one elsewhere you will likely have to contact the company to register the microchip). Secure Collar and Tag: Be sure you have a very secure collar on your pet that he or she cannot escape. The collar should have a very securely attached tag with your phone number(s) on it. 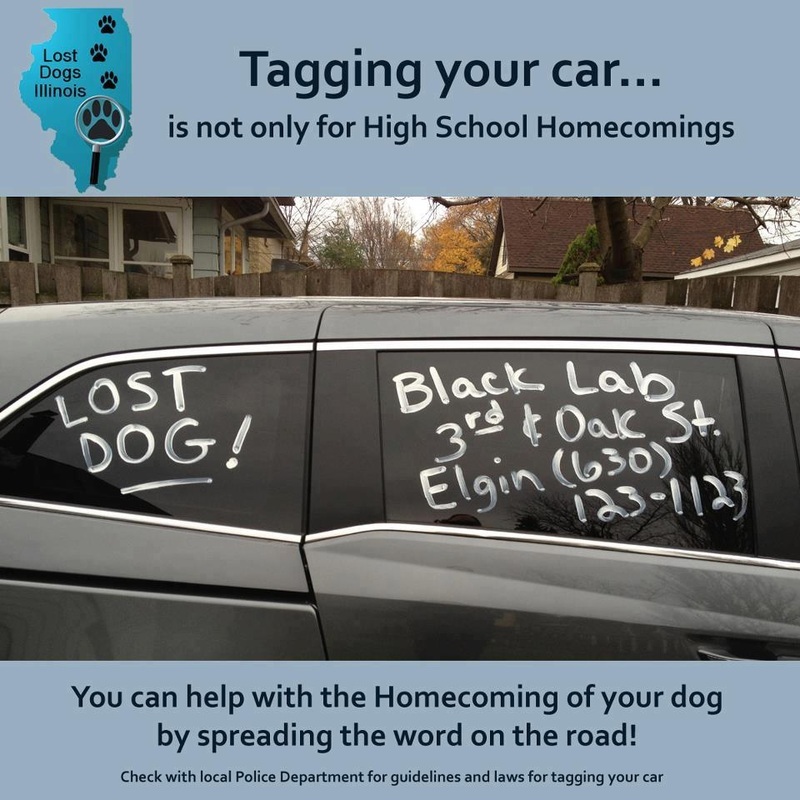 Many tags show a pet's name, but that won't help your pet get home as much as YOUR name. Some dogs are prone to pulling tags off; in a pinch, you can write your phone number on the collar in permanent marker or buy a flat tag with rivets that attaches permanently to the collar. Keep a rabies tag on your pet also; this is required by city ordinance in many places and the registration number on it can be traced back to you. Fencing and Doors: Keep them secure and locked, especially in urban areas where passersby can open them for whatever reason. Don't let your pet wander off-leash. They might wander off, be chased off, or picked up by people who believe they are strays. They also could be attacked by free roaming dogs. In most urban areas, off-leash dogs violate city ordinances and can result in a ticket. The Lubbock Avalanche Journal runs free lost/found pet ads in the "AJ's List Classifieds." On Facebook, Lost and Found Pets of Lubbock, TX. also shares local lost pet listings. You can also find us, the Humane Society of West Texas, on Facebook and let us know there about your lost kitten or puppy, and we will share with our Facebook friends. Signs: When writing signs, keep them short and simple so that drivers can read them. For example "LOST MALE BLACK LAB: Call 123-4567" is easier to read than a wordier sign and still gives descriptive detail. Include a photo if you can do so without crowding the words out. A large, poster-board sized sign can be put in front of your house (especially helpful if the pet went missing in the area). Coffee shops, groceries, and light poles are good places to put smaller signs. Online Ads: Many people post lost and found pet ads free on the "community" section of Craigslist.com. Be careful of scammers trying to defraud you though. You also can email local veterinarians and rescue groups to inform them about your missing pet. Print Ads: Newspapers and classified ad papers will sometimes run free lost and found pet ads. Check locally. Microchips: If your pet is microchipped, contact the company and let them know your pet is lost. Some companies will send out mass emails to other customers in your area about lost pets. Pet service businesses: Veterinarians, pet groomers, and pet stores are all usually willing to display lost dog or cat posters. Stores like Petco and PetSmart usually have bulletin boards in their lobbies and cards for customers to use. Animal shelters or animal control facilities: Many shelters hold stray pets for just 3 to 10 days before adopting them out or euthanizing them. Don't just call the shelter if your dog or cat is missing: go to the shelter regularly and personally look for your pet. Also, leave a lost pet sign or report at local shelters. If you live in an area with multiple shelters, visit each one. Lubbock, for example, has two animal shelter locations, plus there are additional shelters in the towns surrounding Lubbock. Humane Traps: If you have lost a pet cat, be sure and leave out food each night and try a humane or live trap. Cats might be too scared to come out during the day but tend to not travel too far from home. A domestic cat is usually easily lured into a live trap. You can buy live traps at feed stores or online. We also have a limited number of live traps for rent for a low fee+refundable deposit; find us on Facebook for more information.